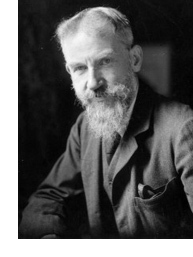 George Bernard Shaw (1856-1950), playwright, critic and author, was born in Dublin, and lived in England from 1876. His writing career lasted nearly seventy-five years. He won the Nobel Prize for Literature in 1925, and an Oscar in 1938, for his film adaptation of Pygmalion. Fantasy and science fiction often feature in his plays. Man and Superman: A Comedy and a Philosophy (1903), has a discussion, in Hell and elsewhere, of the concept of the Superman and of “Creative Evolution”, which seeks perfection, partly through eugenics; and Androcles and the Lion (1912) contains fantasy elements. Press Cuttings (1909), a play about women’s rights set in the near future. Shaw’s first genuine sf play, however, is Back to Methuselah: A Metabiological Pentateuch (1921), a five-part depiction of Creative Evolution, from Genesis through to immortality and, beyond, in the far future, to transformation into disembodied thought-entities. Mobile phones, or their equivalents, are there, and a kind of force-field; London has totally disappeared by the fourth millennium. Critics used to dismiss Shaw’s plays after this as being increasingly disconnected with reality; or one can say that they increasingly deal with the fantastic. The Apple Cart: A Political Extravaganza (1929), is set towards the end of the century, after the building of the Channel Tunnel, and imagines a revived monarchy to protect people from powerful corporations. Too True to be Good: A Political Extravaganza (1932) and On the Rocks: A Political Comedy (1933) are both set in the near future. The Simpleton of the Unexpected Isles: A Vision of Judgment (1935), has “the angels weeding the garden” to rid the world of the unworthy, and The Millionairess (1936) is a satire about eugenics on a near future Pacific island. Farfetched Fables (1950) looks a distant future quite different from that found in Back to Methuselah. For more detail, see the entry in the Encyclopedia of Science Fiction. Haw was born on Upper Synge Street in Dublin, the third child of a law-court clerk and the daughter of an impoverished country gentleman from Co. Carlow. Shaw described his family as they ‘Shaw family of dipsomaniacs’. After 1862, the family began living on Hatch Street with a music impresario, George John Lee, who looked after Bessie Shaw’s musical career, and who indeed helped inspire the young Shaw with a love of music. Shaw was educated at a variety of schools, and became a junior clerk in an estate agency at the age of 15. He was promoted when the head cashier left, and earned enough to live independently: which is just as well, since his father was still on the bottle, and mother and sisters had followed George John Lee to London in 1873. In 1876, following the death of his sister Agnes, he resigned, and went to London himself to join his mother and surviving sister Lucy. Shaw earned some money by ghost-writing for Lee, but he spent more and more time studying in the British Museum reading room, and started writing both plays and an autobiographical novel called Immaturity (not published until the collected Shaw edition in 1930-31). He worked for a while for the Edison Telephone Company, and wrote a novel called The Irrational Knot, which was later serialized in 1886–7 in Annie Besant’s Our Corner, and not published in book form until 1905. In 1881 he came down with smallpox, from which he took months to recover (his famous beard was grow to cover the scars). He began a novel about a prize-fighter, Cashel Byron’s Profession, around the time he discovered socialism (and the delights of affairs with widows or married women). The Fabian Society was founded in 1884, which designed to bring Britain slowly into a socialist future, and from the beginning Shaw was a leading figure. He was also involved in the foundation of the Independent Labour Party in 1893. He became a well-known speaker, and began writing what he called his “missionary books”, such as The Quintessence of Ibsenism (1891) and The Perfect Wagnerite (1898). He began reviewing plays, and writing as at art critic. Between 1888 and 1894 he wrote a series of highly entertaining columns about music. He was an early enthusiast for Elgar, and promoted Puccini and Mascagni, and was seriously enthusiastic for Wagner. His first play was Widowers’ Houses, which had just two performances in 1892. His third play, Mrs Warren’s Profession, completed in 1892, became well-known through private productions; it could not be performed for the public stage until 1925, because of the censor’s reluctance to countenance a play about prostitution. In an interview in 1897 he note that ‘My reputation as a dramatist grows with every play of mine that is not performed’. However, he was beginning to write plays that certainly would become classics, such as Arms and the Man, and Caesar and Cleopatra. In 1898 he was hospitalised, with bone problems; and while still recovering he married his informal nurse, a wealthy woman from Londonderry called Charlotte Frances Payne-Townshend. Man and Superman and John Bull’s Other Island were his first plays in the twentieth century. The latter, which discussed “the Irish question”, became a hit. King Edward VII had a special performance arranged for him in March 1905, after its public run had come to an end: it was said that he laughed so much that he broke his chair. Other important plays from before the war were Major Barbara (1905); The Doctor’s Dilemma (1906); Androcles and the Lion (1912) and Pygmalion, performed in German in Vienna in October 1913 and in London in April 1914. His film adaptation of this in 1938 earned him an Academy award and, of course, in 1956 it became the musical My Fair Lady. Shaw took Pygmalion off at the start of the War, thinking it inappropriate; though in his War Experiences, we can see that he thought it important to write plays with contemporary political significance. The War continues to resonate in his post-war plays. Heartbreak House, written during the War, but first performed in 1920, was about the spiritual bankruptcy of current generation. At the end, a night air raid causes casualties and destruction, yet the drama’s culminating horror lies not in exploding bombs, but in the lines of two women at the curtain. One exclaims, ‘What a glorious experience! I hope they’ll come again tomorrow night.’ The other (‘radiant at the prospect’ in Shaw’s stage directions) agrees, ‘Oh, I hope so.’ Thanatos has replaced Eros [Weintraub, in the ODNB]. Back to Methuselah, first performed in 1922, placed the War in its cosmic position in the history of the world. Shaw’s last significant play was possibly Saint Joan, which had a première in New York just after Christmas 1923. It prompted the Nobel prize committee to offer him the prize for Literature: he took the award, but refused the money. And he did go on writing plays, many of which contained science-fictional elements: The Apple Cart (1928), Too True to be Good (1932), and The Simpleton of the Unexpected Isles (1935). Buoyant Billions, begun in 1936–7, was completed in 1947, just before Shaw’s ninety-first birthday, and again it peered into the future. Charlotte died aged eighty-six in September 1943; GBS himself died in December 1950. Her ashes had been stored at Golders Green Cemetery, and were mixed with his, and scattered on the flower-beds in the former rectory at Ayot St Lawrence, which had been their country home for decades. His will left the house, Shaw’s Corner, to the National Trust. This information was found largely in Stanley Weintraub’s entry in the Oxford Dictionary of National Biography.